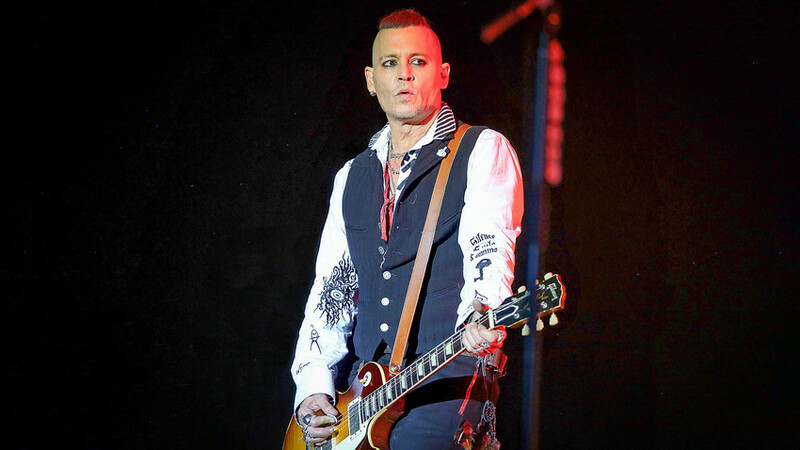 Unlike previous visits to Russia, Johnny Depp came in May not to promote a new movie but to play music in his group, Hollywood Vampires, together with Alice Cooper and Joe Perry. This is hardly surprising because the group exists for already several years. More interesting was Depp’s tourist program in Moscow: he visited Lenin’s Mausoleum, took a photo at Stalin’s grave and went to the Mayakovsky Museum. One might call it “Depp’s Revolutionary tour” because all these names and places are related to that watershed period of Russian history a century ago. Depp visited the Mausoleum on Red Square together with legendary Aerosmith musician Joe Perry, and he also posed for a picture at Joseph Stalin’s grave, who is buried by the Kremlin wall. Judging by the reaction of Twitter users, not everyone in social media understood Depp’s interest in the founders of the Soviet state. Those whose personal pantheon doesn’t include the two Soviet leaders blamed Depp for making a wrong decision. Others, who visibly outnumbered their opponents, praised one of the “Hollywood Vampires” for his interest in Russian history and his supposedly true Russian outfit: a sailor shirt and a cloth cap. As far as Stalin, that’s not the first time when media coupled the two names. Years ago, Depp was tapped to play the young Stalin in a movie. In fact, he was picked by British historian Sebag Montefiore who in 2008 reportedly signed a deal with Miramax studio on making a film based on his book, Young Stalin. “If it's not done in Georgian [Stalin was an ethnic Georgian], Johnny Depp would be perfect for the lead role,” he said. However, all we have today is just Depp's photo with Stalin’s bust; but there also was a collage photo with Depp in a military Stalinist style suit. As far as Mayakovsky, the great Russian avant-garde poet of the early 20th century, Depp expressed interest in an interview in 2013, saying that he’d like “to walk the roads of Dostoevsky and Mayakovsky.” This time he managed to realize his intention partly with a visit to the Mayakovsky Museum. Depp, who played in Kusturica’s “Arizona Dream,” would perform the role of Raskolnikov who plays bass in a punk Brighton Beach band. Some years ago Depp said he’d also like to play Rasputin because “he's certainly a very unconventional character — a surprising, curious one. The incredible story of the man's life is so powerful!” Depp said. The actor’s “Russian list” also includes Mikhail Bulgakov, whose characters Depp would like to bring to the silver screen. In 2013, Depp was dating Hollywood star Amber Herd and a photo of the couple holding hands in Moscow captured the attention of the media. During this visit to Moscow, Depp complimented Russian women, calling them “the most beautiful in the world.” He had some difficulties, however, trying to explain why he said this. Depp’s female fans might have heard these flattering comments. During the Hollywood Vampires concert in Moscow “thousands of years of culture” ended with a few bras flying on stage. Depp then put one on his guitar, and he also adorned his instrument with a rose thrown to him. Surprised by Russia: Why didn’t Trump build his tower in Moscow?